If you are a fighting game fan and love to literally beat your competition to victory then Soul Calibur will be a familiar game for you. It is one of the best fighting game franchises out there but it has been quite for a long time now. In this article, we have collected everything that is currently known about Soul Calibur 6 and have complied that information in one place so that you can find you Soul Calibur fix here. As we all wait for this amazing game to finally land on our gaming platforms, we can look at the gorgeous trailers of different character reveals as well as read all the information about the game. The most important aspect when considering a fighting game is its gameplay. It must be smooth, must work in a flow and should be able to deliver what the player wants from the character. The whole combat system has been revised and some new mechanics have been added in the game. Out of these new mechanics, the most prominent mechanic is the addition of ‘Reversal Edge. This is a great move and when activated it can absorb some damage and then unleashing an attack depending on which button you press out of kick, dodge or attack. We see the return of the eight-way run and guard impacts. Guard impacts do not require super meter any more. This opens up the probability of using them at any time when needed. Pressing the block while attempting to launch a normal attack with cancel it thus making baiting other players easier. You will now be using the super meter for ‘Critical Edge’ attacks, which look really good when performed. There is also an option to use weapons during the combat as most of the fighters come with swords and Scythes. This will further add to the fun and competition during fights. The fights are very streamlined and your enemy’s combo might take down fast-paced giving very less time to think about your next move so you will need to be quick in deciding your next move or you. The game has been developed using Unreal Engine 4 and it looks like that, the engine is doing justice to the game. Even at this early stage of the game, the game looks visually amazing. The special effects ranging from the environment to combat hits, every things looks amazing in the game. The environments look detailed to the last leaf while the character details look flawless. The facial expressions and body movements are very smooth. During the trailers, we see many different beautiful environments and even a bonus Kaer Morhen background from The Witcher universe. This background captures the stunning detail from The Witcher 3 game and brings it to Soul Calibur 6. The visuals coupled with the sound quality looks amazing. Each and every detail from sparks flying from weapons to characters falling to the ground look crisp and smooth. At this stage, the real question is that will Soul Calibur be able to deliver the smooth 60fps experience on consoles as well. With both PS4 Pro and Xbox One X capable of running games at 60 fps and 4K visuals, our only question is that will Bandai Namco go with making the game utilize the full potential of these next gen 4K machines to bring us the best looking Soul Calibur or not. As of now, we have some of the characters confirmed for the game announced by Namco Bandai itself, either through trailers or by press releases. It is true that almost all of the characters from previous games will make a comeback in Soul Caliber 6 and will be even better with the new combat system being implemented in the game. Namco Bandai has been really teasing us with frequent character release trailers. You can find all character trailers below. As of now, we have a confirmed roster of Sophitia, Mitsurugi, Nightmare, Xianghua, Kilik, Ivy, and Zasalamel along with a new character Goroh. 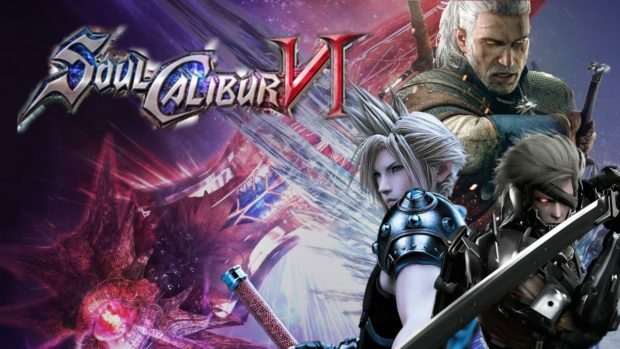 As these have been confirmed so far, we also hope that the series famous characters such as Siegfried, Raphael, Astaroth, Cervantes, Voldo, and Yoshimitsu will return in the sixth installment as well. The game will be incomplete without these series favorites. We are looking forward to a big character roster and we hope that we get more character choices than any Soul Calibur game offered before. Apart from normal characters, there will be some guest characters from other franchises as well. Topping this list is Geralt of Rivia from the Witcher Universe, which is one of our favorite video game characters of all time. This was announced again, in a recent trailer. Namco Bandai just loves to tease us. You can review the Geralt of Rivia reveal trailer below. As Namco Bandai is releasing more characters, we are hoping to see more of the roster to be revealed gradually. Stay tuned for more news on the roster list as we will continue to add them here. As of yet, the only news we have about the launch of Soul Calibur 6 is that the game is planned to launch in 2018. In addition, PS4, Xbox One, and Steam are the only confirmed platforms so far. We have no idea whether Namco Bandai will consider bringing the game to Nintendo Switch or not. This is all what we have about Soul Calibur 6 at the moment. We will continue to dig out more information for you about the game and update here, as we know more about the game. Keep checking back for more information about Soul Calibur 6. We cannot wait for more gameplay videos or a playable demo and we hope that Namco Bandai launches a playable demo in the near future so we can experience the new engine of the game before the launch of the full game. Let us know in the comments below whether you are excited about the game or not and will you be buying Soul Calibur 6 when it comes out!